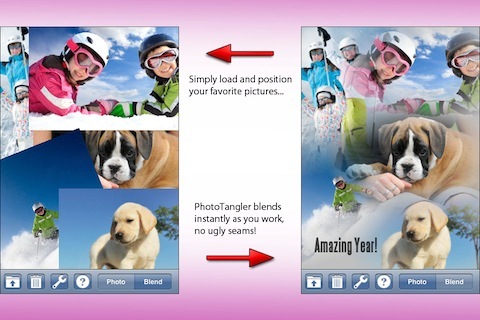 The PhotoTangler Collage Maker app for iPhone creates photo collages to share and save in just minutes. If you want to add visual interest to your online presence, then the PhotoTangler Collage Maker app produces excellent results for just $1.99. The home screen and interface is simply designed. All of the action occurs at the bottom of the screen leaving a nice, open space on your screen to create your photo collage. Each icon produces maximum results and functionality. To create quicker results and produce quality images, then you should start with the info icon. The PhotoTangler Collage Maker app’s info screen concisely presents the efficient function of each icon and tool. The folder icon contains the action features. You can select a photo from your iPhone’s photo libraries. Or, you can snap a photo from the camera within the PhotoTangler app. You add text, as well as share and save from the folder icon. The text interface is incredibly thorough, but in an unobtrusive, less than cumbersome way. You type your text, adjust the font and size, and select color in just a couple of touches. The text pops onto the screen, and you move the text with your finger to place it properly. To fine tune and customize your photo collage, you touch the tool icon and bounce back and forth between photo mode and blend mode. You simply manipulate the background color with excellent interface. There is a disc with a range of blended colors, and you touch the color you like. You can adjust the tone darker or lighter with a volume-style adjustment button below the color-filled disc. The precise, excellent functionality of the background color feature is a much-appreciated detail. By touching a photo on the screen, you can move it and re-size it. To blend photos together and soften the edges, you touch the blend button and drag your fingers on the screen to soften or intensify. If you want to share your photo collage, then you can connect directly with Facebook or save to your library. A suggestion for the developers would be to integrate more social media sharing options directly from the app. You can share via your saved image, but connecting straight through the PhotoTangler app would be ideal. The PhotoTangler Collage Maker iPhone app packs great functionality and successful results in a neat download from the iTunes store. AppSafari review of PhotoTangler Collage Maker was written by Jenni Ward on January 24th, 2012 and categorized under App Store, Photos. Page viewed 5297 times, 1 so far today. Need help on using these apps? Please read the Help Page.